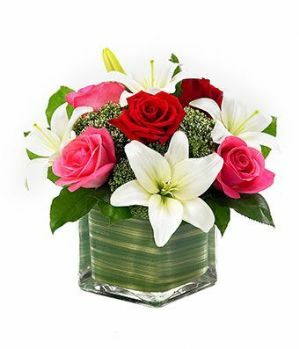 The Lovely Lily and Roses Cube is a beautiful way to send your love today. Overflowing with red roses, pink roses and white lilies, this is the perfect gift to send for an anniversary or just because. We arranged, it is a unique play on the classic romantic floral arrangements. Glass cube measures 10 x 10 cm or 12 x 12 cm depends the size of the arrangement.